Note, that style of main window changes depending on current work mode. It helps to more easily recognize current mode to avoid confusion. See: DB mode vs View mode to more information. The top area of main window contains main menu of Viewer. There are buttons for managing reports ("Import", "Delete", "Clear", "XML" and "Print"), general purpose buttons ("Help", "Configure" and "Stats") and additional edits for managing projects. For more information on usage of these controls see common tasks. Note, that you can change button's configuration. This list displays reports that stored in the report's database (DB Mode) or in the single bug-report file (View Mode). See also: DB mode vs View mode. This list can be hidden by using appropriate button. It is also hidden automatically in View mode if bug report's file contains only one report (some bug report file formats can contain more than one report). By default it contains only few of available columns - you can add or remove any column manually. You can change columns' order by dragging columns' headers around. If "Status" column is visible - then you can change status of the report to "New", "Fixed", "Postponed" or "Rejected". If "Note" column is visible - then you can add or edit additional description of error by simply typing it. The note is simple text that you can add to any report. It can be reason for rejection, for example. There are some powerful ability to sort, group and filter reports in this list. For example: you can view only new reports. Or reports from specific application. Please, see grid usage manual for more information. The bottom area of main window displays currently selected report. This panel is complete analog of EurekaLog error dialog's detailed view. 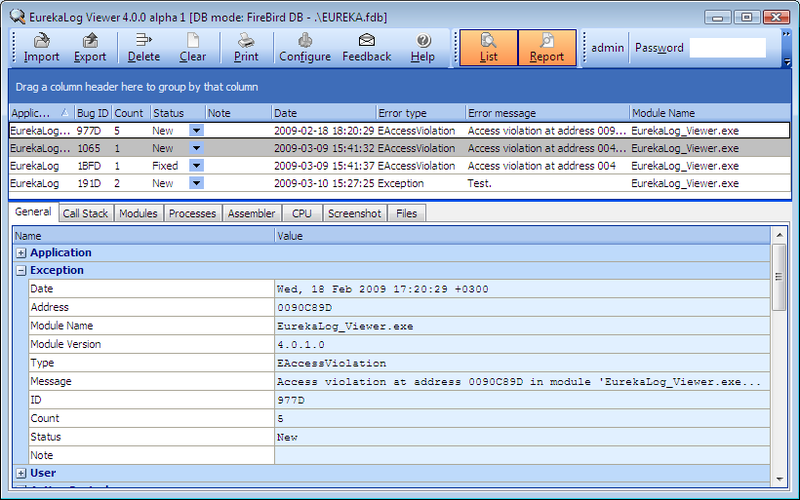 It displays content of EurekaLog's text bug report in convenient way. See also: common tasks.